If you have a soft spot for anything that has to do with the 1990s, then you'll be glad to know that a certain hairstyle is back and cooler than ever. 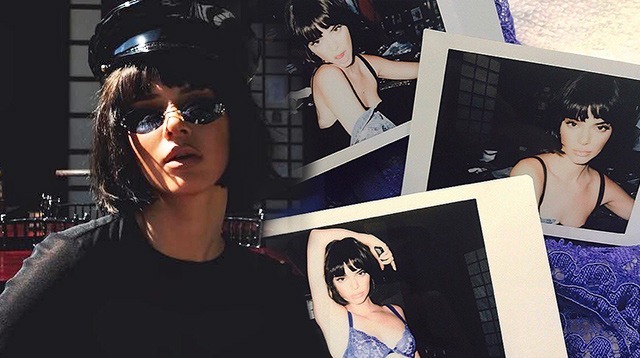 Celeb hairstylist Jen Atkin uploaded a few polaroid shots of Kendall Jenner in a new 'do that she called "Vixen Vivianne" as an homage to Julia Roberts' character from Pretty Woman. While the chin-grazing, blunt bob with flipped-in ends does look like the famous female from the rom-com, we're also seeing another classic character from a beloved film: Uma Thurman's Mia Wallace from Pulp Fiction. Because Mia has dark hair, she and Kenny could pass for twins! And it looks like Kendall Jenner's "model crew" really wants the '90s to come back. BFF and fellow model Bella Hadid was also seen wearing a similar style sans full bangs. Bella accessorized her tresses with a barrette (So '90s!) and wore an outfit that combined elements from classic movies such as Clueless and The Craft. Next thing you know they'll both be wearing matching outfits and saying "As if!"